Let this satin white metal coat rack enhance your home with excellent functionality. There is plenty coat, hat, glove and umbrella storage with 2 tiers of hooks. A beautiful finial adds a touch of class to this fashionable coat rack. Let this satin white metal coat rack enhance your home with excellent functionality. The new RKW16-18 rack from Atlas Sound provide a great way to secure rack mount AV components in boardrooms, classrooms, and other applications. The simple knock down design allows for easy storage and transportation to the job site. Assembly is a snap with a furniture style cam lock system. One pair of 11gauge rack rails provides support for up to 250lbs. of rack mount equipment. Built for the entertainer and designed for the wine lover, the Utopia Sideboard is the perfect blend of quality craftsmanship, style, and modern functionality. Featuring ample storage with three extending drawers and two concealed shelves, the sideboard also includes four spots to hold your favorite bottles of wine in between celebrations. Copper metal round door handles add subtle glamour and sophistication to this bold statement piece. Available in off-white and maple cream and white gloss and maple cream. 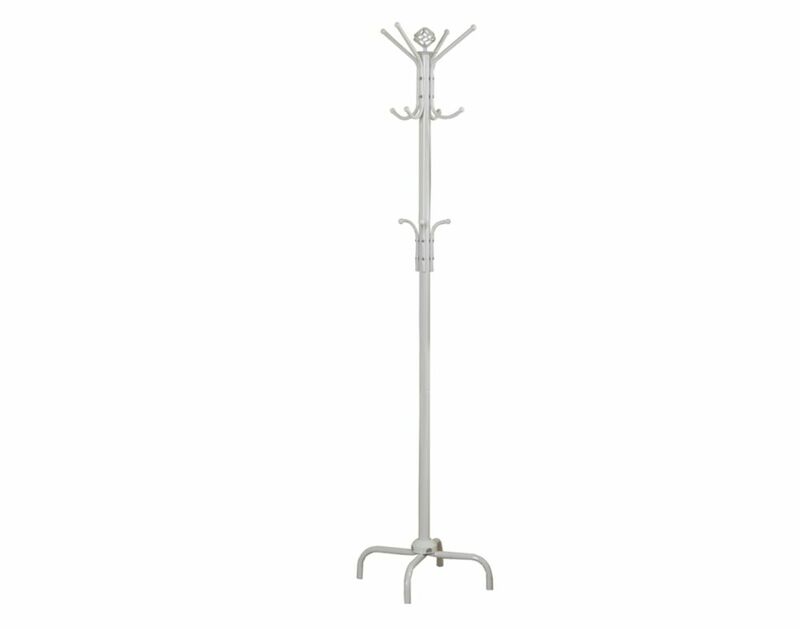 Coat Rack - 70"H / White Metal Let this satin white metal coat rack enhance your home with excellent functionality. There is plenty coat, hat, glove and umbrella storage with 2 tiers of hooks. A beautiful finial adds a touch of class to this fashionable coat rack. Coat Rack - 70"H / White Metal is rated 2.0 out of 5 by 3. Rated 1 out of 5 by Christine from Nice look, but very unsteady I like the look of the coat rack and was fairly easy to put together. I need to tighten the bottom screw a lot because it comes loose and then the coat rack is unsteady. I would not buy this again, but it is not worth the hassle of returning it. Rated 1 out of 5 by Runtster from Disappointing I liked the look but superficial painting wasn’t even. Disappointing. Will be returning. Rated 4 out of 5 by Aimee from Does the job Bought this a month ago and it’s great. Like that there are lots of hooks and a variety of levels. It was easy to put together. It a little wobbly, but not to the point that i worry it will tip.